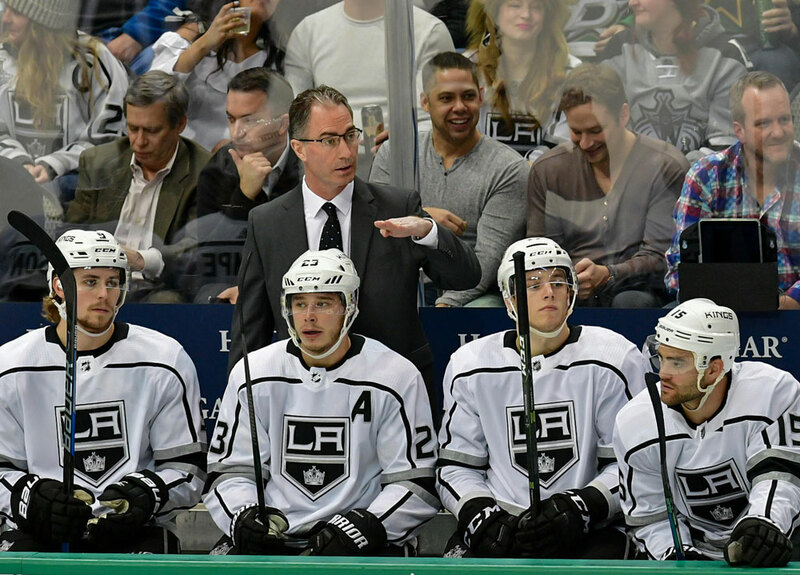 The John Stevens’ head coaching era in Los Angeles failed to hit triple digits as the Kings let him go after a total of 99 games in charge, including last year’s postseason. Second-year general manager Rob Blake made the announcement on the morning of November 4th and also said assistant coach Don Nachbaur was let go. The timing may have seemed a little strange considering just a few hours earlier the Kings had taken care of the Columbus Blue Jackets to the tune of 4-1 at the Staples Center. It’s likely that Blake and Kings’ president Luc Robitaille decided the coaches’ fate a couple of nights earlier when the team was trounced 5-2 at home by the Philadelphia Flyers. Yes, the Kings sit in the cellar of the Pacific Division with just nine points from their 4-8-1 record, but they had won two of their previous three games before Stevens was sent packing, so was the club on the verge of turning things around anyway? We’ll never know since Willie Desjardins will now be steering the ship until the end of the season, starting with LA’s home game against the Anaheim Ducks on November 6th. Perhaps the fact the Kings shared 31st place in the 31-team NHL with the Florida Panthers was the reason Blake pulled the trigger when he did. Along with Desjardins as the new head coach, former Kings’ player Marco Sturm was hired as an assistant to take over from Nachbaur. Still, the team was just 10 points out of first place in their division when Stevens was sacked and the Kings had two games in hand on the table-topping Calgary Flames. There’s no doubt they’re still in the playoff race, but Blake must have thought they’d soon be out of it if changes weren’t made. Stevens had been with the Kings since June, 2010 when he inked a three-year deal to serve as an assistant to head coach Terry Murray. However, Murray was given his pink slip the next season and Stevens suddenly found himself behind the bench. He didn’t have the chance to get too comfortable though since Darryl Sutter was brought in to take over the reins just four games later. Stevens went back to his regular assistant’s role and worked well with Sutter as the Kings hoisted the Stanley Cup for the very first time at the end of that season and again two years later. His title was changed to associate coach in 2014 and he caught his big break when Sutter joined the ranks of the unemployed in April, 2017 by being named the club’s new head coach. He didn’t fare too badly last season as the Kings went 45-29-8 for 98 points and finished fourth in the Pacific Division. Unfortunately they had to face the upstart Vegas Golden Knights in the first round of the playoffs. Vegas were the Pacific Division winners and arguably the best-ever expansion franchise in sporting history. The Kings went toe-to-toe with them, but came out on the wrong end of a four-game sweep even though they were outscored just 7-4, losing all four games by a single goal. Of course the Knights went on to the Stanley Cup Final where they were finally halted in five games by the Washington Capitals. The LA vs Vegas clash may have tied a record for the lowest-scoring seven-game playoff series, but it was one of the most exciting of the entire postseason. It made management aware that the squad needed some more firepower up front though and that’s why 35-year-old free agent Ilya Kovalchuk was signed from Russia in the summer at $6.25 million a year for three seasons. Anyway, Stevens went 49-41-9 while in charge of the Kings, including the postseason and that’s the end of that history lesson. Now we need to take a look at his replacement and figure out if upper management made the right move. First off, Desjardins is nine years older than Stevens as he’s 61. He’s best known by NHL fans for his stint with the Vancouver Canucks from 2014 to 2017 and going 109-110-27 with a relatively weak squad. The Canucks made the playoffs in his first season by finishing second in the Pacific Division, but were taken down by Calgary in the first round. He then finished in sixth and seventh place the next two seasons. The native of Climax, Saskatchewan, Canada, yes that’s a real place folks, has been coaching since the mid 1980s and has worked in Canadian junior hockey as well as the American Hockey League (AHL). He was also the bench boss of the 2018 Canadian Olympic team and took home a bronze medal. Desjardins won a Calder Cup with Texas in the AHL in 2013/14 and had a fine record in junior jockey. He’s known for working well with youngsters, but he’s now going to be taking over one of the NHL’s oldest teams as the Kings’ average age is about 29. There are several veterans on the roster and it’s often hard to coach them since they’re usually set in their ways. It’s not fair to write Desjardins off before his stint begins, but I think the Kings may have made a wiser choice by going after another former Canucks’ coach in Alain Vigneault. The 57-year-old also worked in the Canadian junior ranks as well as an assistant with the Ottawa Senators. He’s held head coaching positions with the Montreal Canadiens (1997-2001), Vancouver (2006-2013) and the New York Rangers (2013-2018). He missed the playoffs in just four of his 15 NHL seasons and took the Canucks to the Stanley Cup Finals in 2010/11 and repeated the feat with the Rangers three seasons later. Vigneault is the all-time wins leader in Canucks coaching history at 313 and was named the NHL coach of the year in 2007. He has about 1,000 games more NHL coaching experience than Desjardins and boasts a record of 648-435-35-98. It’s just personal preference, but I believe he’s a better head coach than Desjardins at this point of their careers. But it will be Desjardins who takes over a team which is without its number one goalie Jonathan Quick as he’s once again sidelined for a lengthy period of time. But on the bright side, former captain Dustin Brown is back from injury after a career year last season and he’s netted two goals and two assists in his three games since returning. Let’s face it though, Stevens and Nachbaur were let go because the players are under performing and we all know it’s a lot easier to fire a coach or two than it is to overhaul a squad with demotions and/or trades. The Kings were scoring at a league-low pace of 2.15 goals per game when Stevens was terminated and were allowing 3.46 goals against. Ultimately it was Stevens’ job to make sure his roster played up to par though, and perhaps his tactics and preparation methods weren’t in tune with the modern day NHL. Then again, Blake and Robitaille are responsible for putting the team together. But if I were a Kings player at the moment without a no-trade or no-movement clause I’d be giving it all I’ve got just in case I’m next.